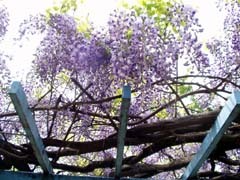 Casting my ballots for mayor and city councillor and on my way back to home, I found this wisteria trellis in tha park. Although it was cloudy, they were in full bloom and so gorgeous that I couldn't help taking a picture. This is a present from my husband, celebrating our 20-year marriage. Some people say, "Hey, you should be grateful because most people get nothing for that," but how can I be happy with this sansevieria? I don't get it. I wonder if his message is, okay, I shoud live strongly by myself like a tiger.